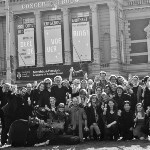 In late 2011, six Dutch orchestral musicians defied prevailing trends and created a new musical collective. They wanted an ensemble which would distinguish itself not only artistically, but in its range and flexibility. LUDWIG – the name of course refers to the cultural entrepreneur in classical music - varies in size from a soloist to full-scale Beethoven orchestra. 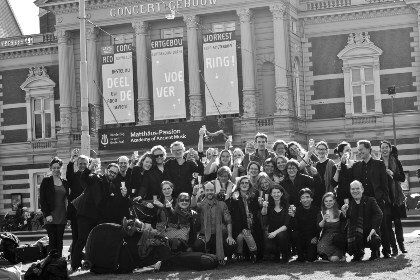 The dream became reality: in no time at all the collective, with its fearless elan and contemporary vision for established repertoire, shot to prominence in the Netherlands. These fine musicians continue to perform the greatest music to the highest possible standard but free from the organisational and management norms of conventional ensembles and orchestras. And distinctive it certainly is: the musicians often play from memory, interact directly with their audience, experiment with different forms of presentation, collaborate with makers in other disciplines and have staged a number of legendary appearances with leading soloists such as Barbara Hannigan (who also conducted). LUDWIG also embraces the new and youngest talent they can find. The collective recently started a pioneering performance and research project LUDWIG and the Brain, exploring the impact of music on specific target groups.